The Comprehensive Programmer begins the same way as the Basic Programmer, with a Programmer Setup Pane and a Roster Pane. The content are identical, so they will not be repeated here. Just be sure that you select the Comprehensive Programmer in the DecoderPro Preferences, Roster pane, Program TAB, then select the locomotive you wish to program from the DecoderPro main screen from the roster list, now press the Program button. We have programmed the Athearn FP-45 in the Basic Programmer, it is on the roster list and has been addressed. If we want to add the extra features of the decoder, we will select the locomotive from the roster list then, set preferences for Comprehensive Program then click the Program button. The Programmer window will open as shown below. All programmers, Basic and Comprehensive, open to the Roster Entry pane, which will be similar to that shown below for the FP-45. The programmer opens with the roster entry page filled in because we selected the loco from the roster panel in the previous screen.. Note that there are now a whole lot more Tabs at the top of the page, allowing us to open many panes to program more features. The number of TABS will depend upon the decoder being programmed. 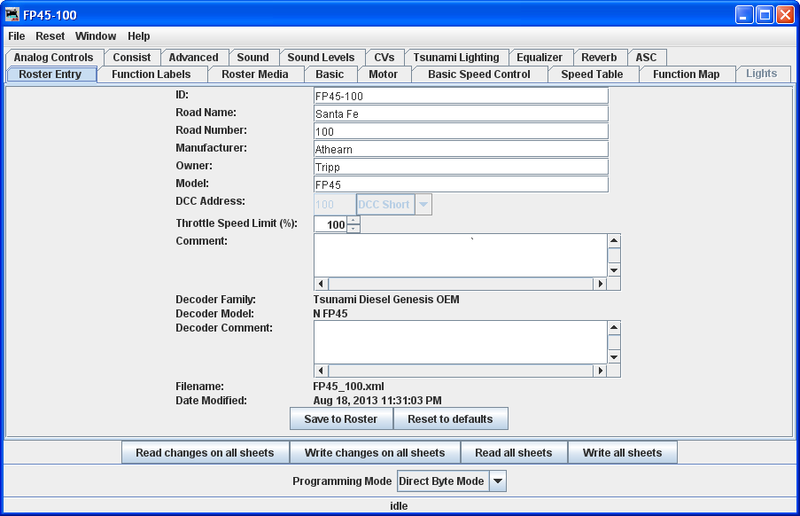 This Tsunami Sound Programming has several TABS that are unique to sound decoders. Note that the Roster pane is essentially unchanged from the Basic programmer, but the window has a LOT more options in the Tabs at the top. If you are unsure how to handle the Roster information, go back to that section in the Basic Programmer. If you're ready to move on to bigger and better things, let's go to the next tab.